In fact, a few weeks ago, Roger was preaching a sermon on little boy Samuel responding of the calling of God. In the middle of the sermon, he walked out into the aisle and one of our one year olds, Julian, started reaching out and crying for Roger. 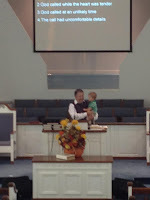 Roger could not stand it so he went and got him and finished his sermon, without missing a beat, holding little Julian. Julian had been restless all morning, fighting sleep. While in Roger's arms, he stared at him and never made a sound. I feel that earlier we teach them, the better it is. Many times people tend to think that the little toddlers and younger preschool kids to not have a clue, but trust me, they are absorbing much more than we realize. I have two year old in my Sunday School class that keeps me hopping; Carmen. She can say Mrs. Kathy........but for some reason, I am Mrs. Fluffy. (Out of the mouths of babes......) One week she was rolling on the floor and not paying any attention to the lesson. The lesson was about Zacchaeus. While eating her snack, she looked at the tree on the wall and said "Jesus' in there." I asked her where? She said, "He is that hole. He gonna go home with me." SHE WAS LISTENING. She might not get the entire story correct, but the foundation is being lain. Another class, we were talking about Noah's Ark. I was telling the kids that Noah was mad at the mean people, so he was going to send lots and lots of rain to kill them. Little Carmen asked, "God mad?" I said, "Yes, God was mad." She looked up towards the ceiling and said, "No, no, God. That not nice." I say all this to say......little children are VERY important. Even Jesus spent lots of time with little children. I guess I have little children on the brain today because, not only do I have a passion for the children, we are expecting our first grandchild very soon. Recently, I have felt a lot like I remember feeling in my college days. I was a decent student and did not procrastinate too much, but come exam time I can remember feeling like I was in well over my head. Trying to balance my time between tests, papers, and projects all the while not wanting to forgo any social commitment, left me with frayed nerves and little sleep. My September was CRA-ZEE! Like many of you may do, I forgot the word "no" from my vocabulary and found myself over-committeed and over-committed. It has spilled over into my October and it doesn't seem to matter how organized I try to be, but little things are falling through the cracks. Some of my commitments are my own doing. Others are where I have been "volun-told." Either way, it is too late. The commitment was made. The responsibility is now mine. Then I have my own expectations to contend with. In order to stay sane, I have prayed for God to by my priority and for Him to set my agenda. I have shied away from a to-do list, because I have wanted to give God the freedom to dictate each day what is truly important and what really needs to get accomplished. A list that never seems to get any shorter would just stress me out all the more and that would lead to all kinds of extra "issues" (aka sins) on my part. I must say that God has been so faithful. As I have sought Him above all else, all the really important "stuff" has gotten done on time. A couple of times I have even had time to spare! In seeking God, and asking for His guidance, giving Him control on how I steward my time, I have also learned what really isn't that important. Those things He is teaching me to just let go, to let them fall. For example, my house isn't the cleanest but I have still enjoyed sweet fellowship with friends here. My friend's birthday gift will be given a week late but I have had sweet moments reading with and playing with my daughters. Dinners have come from a take-out box but the conversation over the Kung Pao Chicken was meaningful and needed. It IS hard to let things fall. As women we often feel if we let something fall, then we fail. Dear Sister, I have to believe as we allow our Father to order our steps, we have to trust that He knows what is best and won't allow that to happen. IF we give Him that control, we will be blessed. We just have to open our hearts and our hands, giving up that control to submit to live the full life He promised us in John 10:10. I know, I know, I know that is a whole lot easier said than done. For me, I have to daily surrender it back to Him. Some days, some hours I have to surrender it back over and over again. A spotless bathroom, an empty sink and a whole lot of ironing have fallen. What is it that God is calling you to let fall? Is It Fall Or Is It Spring? I totally, completely love this time of year. I don't know about your little corner of the world, but ours here in Clarksville is absolutely beautiful and amazing. The trees have not looked this vibrant in years. The temps have been perfect and there has not been a hint of summer's humidity or winter's harsh freezes. Recently I shared my love of this my favorite season with a dear friend. She had a sad look cross her face and she replied that she never much cared for autumn. She had lost a grandparent and a parent in the fall. It was in a fall month that her husband had left her for another woman and her whole world fell a part. Instantly, I hurt for my friend. I can understand some of her heartache, but I hurt more that she seemed to re-live that pain whenever the season changed from summer to fall. Yearly, all those hurts come back. Where is the healing? Where is the peace? Dear sister, you may be just like my dear friend. Please do not let Satan rob you of today's beauty and joy by keeping you chained to some other year's baggage of hurt, depression or fear. Ask God to bring healing from where those chains have cut you and freedom by removing those shackles altogether. Let Him redeem your fall. This past weekend, I played in the yard with my children, drawing on the front walk with colorful pieces of sidewalk chalk. I went with my family to a pumpkin patch and acted like a complete fool trying to get a decent picture of my three year-old. I met a young lady from our student ministry for a Sunday afternoon stroll through a city park, talking of God's goodness and provision while taking in the colorful scenery. I share all this to say to illustrate the joys God gave me during this beautiful, fall weekend. Every season has its trials and tribulations, but every season also has its great blessings and moments to savor and enjoy. Seek Him, the magnificent Creator of all this beauty. Fall does have to be the season where life quits blooming, waiting for winter. Fall can have a fresh, new life of its own. Let your fall this year be more like spring. Find and savor the blessings God has for you and you just might feel the budding freshness of true hope. Thank you, thank you, thank you! Thank you to all of you who have prayed for me, our pastor search committee and our church as we sought God's will for our new pastor. Yesterday, our new pastor, Larry Riley, preached his first official sermon as our pastor. What a journey and a year it has been?! Our committee of 15 (yes, we know that is a very large search committee) witnessed God unfold His will for us. We prayed. We surveyed the congregation. We prayed. We made a profile of who we thought the man we were looking for would look like. We prayed. We read over 350 resumes. We prayed. We watched countless sermons online. We prayed. We contacted numerous references. And, yes, we prayed some more. One thing we all knew from the beginning and had confirmed through the congregational survey and other conversations with church members was that we knew we were calling a family, a husband AND wife, not just a man. So, now THEY are here. Pastor Riley has begun meetings with current staff members, deacons and support staff. Pastor Riley is preparing sermons and preaching. He will be making appearances and meeting people at various functions and get-togethers. No doubt, he has hit the ground running just as those of us on the pastor search committee knew he would. But what about her? "Her" name is Elizabeth. She has been prayed for and her arrival anticipated almost as much as her husband's. Her virtues and gifts have been touted. Even I got to share some about her in testimony form during the service he would preach his "in-view-of-a-call" sermon. Then, I overheard someone jokingly reference a halo when they introduced themselves to her yesterday after the second service. Honestly, ever since I heard that, it hasn't "sat" right with me. She graciously smiled and accepted the complement as that was how the comment was intended. But, it hit me; she has a large congregation watching her, judging her, waiting on her to decide what kind of pastor's wife she is going to be. Everyone has good intentions. However they have expectations based on their own individual experiences. Talk about big shoes to fill! On top of all that, their belongings are still 12 hours or so away. They are waiting to move in until a home is ready for them. She is trying to home school her 10th grade son. Additionally, their move here meant she had to leave her job. All of this transpired in 2 weeks. Elizabeth IS wise and godly. She can handle the "fish bowl" and will rely on God to meet her and her family's needs. However, she knows she needs prayers. My welcome gift to her is my commitment to truly and sincerely pray for her. Will you commit to pray for her too? Since that time I rarely, if ever, “post” (because I am way too private and insecure to do that!) but I do enjoy seeing pictures of friends and their families and keeping up with the lives of people and reconnecting with many friends that I never get to see. However, not too long ago, I realized it had become problematic. Facebook was causing me to sin!! Yep! There—I said it! Facebook was causing me to sin!! I was jealous when I read about people who were doing fun things together without me. I was anxious when I read about someone in our church visiting another church. I was fearful when I tried to read into what someone was not saying. I was angry when I read people criticizing others. I was frustrated when I read another pastor’s wife complaining publicly. And the list could go on and on!! So, what was I to do? Confess for sure (once I finally understood that I was sinning when I read posts—which unfortunately took me way too long to comprehend)!! Then I realized, for me, for a season, reading Facebook daily was not healthy. I checked for messages and to see if anyone wanted to be my “friend”, but I had to stop reading everyone’s posts for a while. Do any of you sin using Facebook or is it just me? It is amazing how the enemy filtrates areas of our lives without us even realizing it! Now I know that before I even open up Facebook, I must pray first!! Asking God to protect my heart and my mind and to give me self-control and not waste time…..etc! I love you guys….and I really do want to be your friend…..and I do want to pray for you and encourage you and hear about what is happening in your life and in your family’s lives and I do want to see your pictures….I just want to do it all without sinning!! This is my week to blog….I wanted to write something Monday--nothing! Tuesday--nothing! Now it is Wednesday...and I still got nothing to say! I got nothing. (And I know grammatically I am suppose to say I’ve got nothing). I am not mad. I am not sad. I am not depressed. It’s just that I got (I’ve got) nothing to say! At least nothing that God has given me to say. I have asked. I am listening. I got nothing! So, what do we do when we got (we’ve got) nothing to say? Make something up? Say something that God spoke to us long ago? Say something God said to someone else? Yes! That is what I should do! Unfortunately, too many times that is what I do do!! Not this time though. Nope. I am mute. I got nothing. So….as MercyMe would say…..Word of God Speak….! Unless the LORD had helped me, I would soon have settled in the silence of the grave. I cried out, “I am slipping!” but Your unfailing love, O LORD, supported me. When doubts filled my mind, Your comfort gave me renewed hope and cheer. It is so funny how God can speak to us. The other day I was preparing to do my quiet time before beginning a very busy day. You know those days where you list is a mile long and you need a good supply of chocolate for your energy boost. Anyway, I said a quick prayer and ask the Lord to show me something new, fresh, and to speak to my heart. I also asked the Lord to bring an idea to mind about which I could share with you. I opened my devotional guide and the scripture was Psalms 23. “Okay Lord,” I said aloud, “you know that I know these verses by heart, so what do you want me to learn today?” Well girlfriends, God just poured out some thoughts regarding ministers’ wives from these six simple verses. I was in awe and very humbled by what God was speaking to my soul. Verse 1: God is all we need. In this world where people strive for fame and fortune, God is all we truly need. For example, my husband and I have lived in everything from an old, falling apart mobile home to a beautiful five bedroom home. We have opened the last can of beans and feasted on it. Tithing truly is act of faith when you place your last dollar in the offering plate and wonder where you will get the money to put food on the table. However, God was and is always faithful. He is our All in All, our Hope, our Shelter. What more could we ever desire? Verse 2: He wants us to rest. I do not know about you but as a minister’s wife I long for time to just sit and rest. My spirit gets empty, my soul (and body) aches, my mind is weary of ministering to people. We not only have a church family, but we must care for our families, hold down a secular job, etc. There are days when I long for a green pasture to walk barefoot in or to lounge by a babbling brook as it sings a lullaby to my soul. Since I am a beach bum at heart, I find complete rest and relaxation sitting on the white sandy shore of an ocean as the waves wash over my bare feet. Verse 3: If we are in right relationship with the Lord, He will lead us. Way too many ministers’ wives are holding too many jobs within the church. We are stealing blessings from someone else plus taking our eyes off the Lord. I know from personal experience that when no one else would fill a role at church I would attempt to tackle it. I would not pray about it. I would simply do it. Boy, did I mess things up! Instead of following what God wanted me to do, I did what Vickie wanted to do and ended up in the muddy ditches and thorny bushes. Verse 4: Dark valleys will come. Ministry is a difficult job. Sometimes people do not like you. Sometimes issues arise in churches and can hurt the fellowship. Sometimes God moves us from one place of ministry to another. Sometimes we experience illness, death, financial stress, etc. Many ministers’ wives choose to not be “involved” in their husband’s ministry which can lead to marriage strain. Some ministers’ wives struggle with depression and loneliness. We need to remember that God is our Shepherd and He will lead us through these dark valleys if we stay close to Him. He already knows what lies ahead in the bend of the road or just over the hill. All He asks of us is to walk by His side and not wander off. I have discovered that even in the darkest valleys of ministry God’s perfect peace surrounds me if I am focusing on Him. Verse 5: The enemies will come. I think anyone in the ministry has experienced attacks from the Enemy. Satan and his demons stand waiting for any issue to arise in our lives or the church in order to destroy us. Often he comes in sheep clothing by way of a church member or he may stand out in the world opposing anything Christian. I am just wondering how many of you have had a church member come to you to criticize your husband, children, a ministry of the church, or you. I know I have and even though I know it is the Enemy it still hurts. We may believe that all is lost but God promises that if we keep our eyes focused on Him that He will lift us up and our cup will overflow with endless blessings. Verse 6: We are pursued! Even on the loneliest, hardest, darkest days, I know that God is pursuing me. When I wander way and get caught in the muddy ditch or the thorny bush, He comes looking for me, calling my name. When I cried out to Him, the Good Shepherd faithfully and lovingly picks me up and brings me safely back to the fold. Psalm 23 is very precious to me because my mother taught these verses to me as a very young child. It is the first thing I can remember memorizing. I have read it thousands of times. However, God revealed Himself in a new light to me this week. I would love for you to join me in reading again this passage and share how this passage may relate to us as ministers’ wives. Since you are my sisters in ministry and we are part of God's big family, I wanted to show you a glimpse of our new family member, Gideon James Lee. Yes, I became a uh . . . grandmother (I am still having a little trouble saying that) in August. Oh sisters, this little guy (G-Man) is his Vivi's favorite man now. After all the saddness, sleepless nights, illnesses, moves, and weariness of this year, God placed this little boy in our lives. He already has brought so much joy to our hearts. My husband and I wait daily for photos to be sent to us via text, email, or Facebook. Yep, God knew we needed a dose of His goodness in human form so He sent us Gideon. As a minister's wife it is sometime easy to forget that God cares for us. Sometimes we feel lost in the world of "doing" church, holding down the homefront, and managing an secular job. But God has not forgotten us. He has blessed us in so many ways. If you are feeling down today, take a moment to pause and think of ways God has blessed you recently. You can at least put at the top of the list that you have salvation through Jesus Christ. So girlfriends, get busy making your list. I want to hear about some of those blessings and I am sure our blog friends do to. 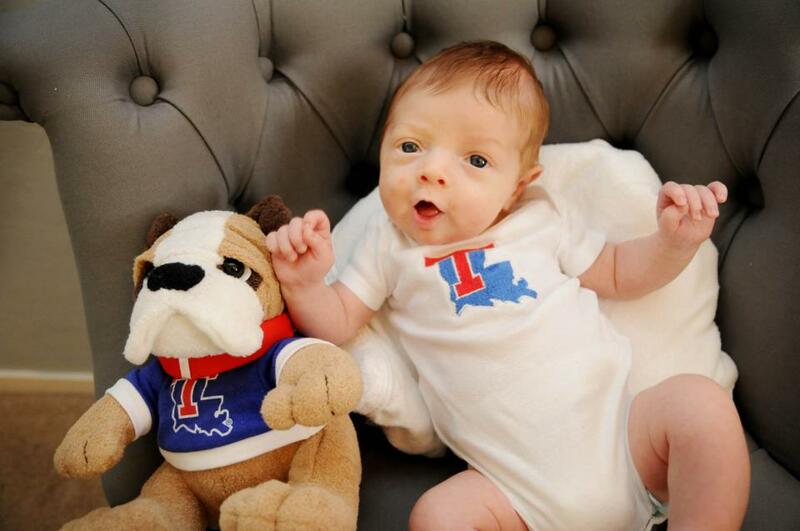 Oh, by the way, Gideon is calling the Louisiana Tech Bulldogs. It's a family tradition! Oh and yes, I will be introducing G-Man to chocolate in the near future. Ladies, our church recently hosted a women’s conference, and the theme was “Order My Steps”. It was a wonderful weekend in the Lord’s presence! We were challenged to walk worthy of the Lord in different areas of our lives; we experienced a blessed time of praise, worship, fellowship, and sitting at the feet of Jesus! I wrote a short devotional for our conference booklet, and I would like to share it with you. Do You Desire To Walk Worthy? What does it truly mean to walk worthy of the Lord? Have you ever pondered this question? Can you look at your life and with assurance declare that you walk worthy of Christ? We who belong to the Lord should have a deep longing to walk worthy of our awesome Savior who loved us and gave His life for us. But how do we live this out on a daily basis? To truly walk worthy of the Lord may be difficult at times, but any sacrifices that we have to make to live it out do not remotely compare to the sacrifice that Christ made for us on Calvary’s Cross. Ladies, walk worthy for God’s Glory! Have you ever taken the time to reflect on milestones in your life? A milestone could be a birthday (physical birth and spiritual birth), a graduation, a marriage, the birth of a child, a new job, a mission trip, a ministry assignment, a retirement. It could be many things; we all have several of these life-defining moments when we have gone to a new season or made a transition in our lives. I do realize that not all milestones revive pleasant memories. For instance, the death of a loved one, a lost friendship, a job loss, a move, and others such as these can trigger memories and emotions that we sometimes try not to relive. Yet even in the midst of these types of milestones, I believe that the Lord can remind us how He has kept us and given us comfort in these valley experiences. Reflecting on joyful milestones in our lives can remind us of what a good God we serve and how He has lavishly showered us with blessing after blessing over the course of our lives. Sometimes it is refreshing to recall the different seasons in our lives where we knew for certain that God was working, perhaps you could even write about these moments in a journal. One milestone (and there are sooooo many) that I want to share is the fact that I was given the opportunity to contribute to this blog. The Lord knows that I love to write and I love to encourage, and I praise God that He took my desire and made it a reality, and my goal is to honor Him with every post! Do you have special milestones in your life? Take the time to reflect on your own personal life-defining moments, and see just how FAITHFUL the Lord has been in your life! As I write today I am thinking of my oldest son, Stephen, who is a Captain in the Air Force. 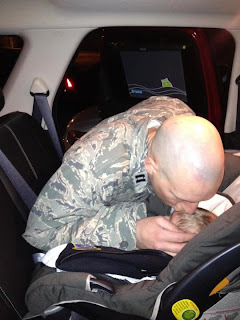 Just two weeks after the birth of his first child, he deployed to a part of the world that is full of unrest. He spent a short time on our soil training before actually departing to his assignment. Right now, I am wondering what he is doing and if he is safe. Another concern I have is for Stephen’s wife, Robyn, and our grandson, Gideon. We try to call or text nightly to check in on them. Our prayers not only blanket Stephen but we pray for Robyn and Gideon as well. My husband and I traveled to Las Vegas shortly after Gideon was born. It was a twofold trip-see the first grandchild and say goodbye to Stephen before he deployed. Oh ladies, I can tell you that on the day we left Las Vegas my heart broke. I grabbed my fully-grown son in a bear hug and began to sob. As I walked away that day I kept looking back to memorize his face but in doing so I kept seeing Robyn as well. Stephen had told us weeks before that while he was away to please take care of Robyn and his child. I want to say I am so proud of my son and his willingness to serve his country. He is following in the steps of so many other men and women who protect our freedom daily. However, I think we too often forget the spouses and families left behind. These special people sacrifice too. There are missed holidays, birthdays, anniversaries, and other special events. As a church family we often pray for our military and their families. However, what do we really do to encourage them? Personally, I am trying to send a card each week to my daughter-in-law. I try to provide an encouraging scripture verse or a funny story about her husband. Just yesterday I mailed Robyn a card with a gift card to her favorite yogurt place. I hope it puts a smile on her face. One of Robyn’s friends in Louisiana hosted a card shower (I had never heard of a card shower) through Hallmark.com. People simply signed up for the shower and could either purchase a card on-line or mail one from home. When Robyn went to her mailbox on the assigned day of the card shower, she found it overflowing with cards and notes of encouragement. I have asked a couple of ladies who had family members deployed what people did for them. One friend said that receiving a card in the mail always brighten her day. My aunt whose husband was in Vietnam shared an entirely different view. She said during the Vietnam War people did not welcome soldiers home as they did in the past and now do. In addition, the families left behind were shunned because people did not agree with the war. Although many in her church were very supportive and checked on her and the children weekly, other members of her own church turned their backs on the family. How very sad! My daughter-in-law suggested offering to babysit so she could run errands, offer to bring a meal, or just come visit for a short time. Her church family in Vegas is doing just that. So ladies, I need more suggestions on how to minister to families of deployed soldiers. I would also like fun suggestions on what to pack in goodie boxes for my son while he is away. Currently, I am trying to figure out a way to ship chocolate chip cookies so that the chocolate does not melt in the desert heat. I hope you don't mind but I want to share this photo with you of this sweet moment. For many years now, October has been designated as Pastor/Clergy Appreciation Month. I have been curious about how this yearly recognition originated. So in this blog, I wanted to inform you (and some of you enlightened sisters may already know) about the history behind why there is a month designated to appreciate our devoted pastors who stand behind the pulpit Sunday after Sunday proclaiming the Word of God. These committed servants also spend countless hours ministering to the flocks that the Lord has entrusted to them. Many of us are married to these wonderful men, and I am sure we already appreciate them dearly. The organization Focus on the Family officially named Clergy Appreciation Month in 1994. The month of October was set aside as the time to honor a church’s pastor, including staff ministers, and their families. The goal in initiating this observance was to make those who are called to minister to feel appreciated by those they serve; the overall intent was to be sure that the recognition of the pastoral staff and their families should become a normal part of a church’s ongoing care of these servants of God.